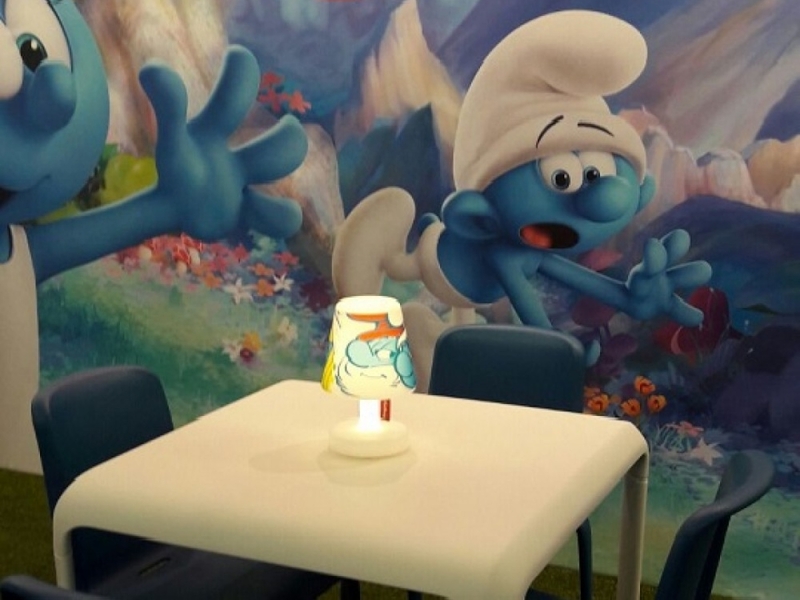 With a global licensing programme managed by the Belgian company IMPS, the Smurf brand has been a worldwide success for many years. The participation in professional trade fairs as privileged meeting points with brands and retailers who appreciate the heritage of our little blue friends is nothing new to IMPS. Their wish was to find a unique partner to create a new concept of reusable stand and to manage it at international level. 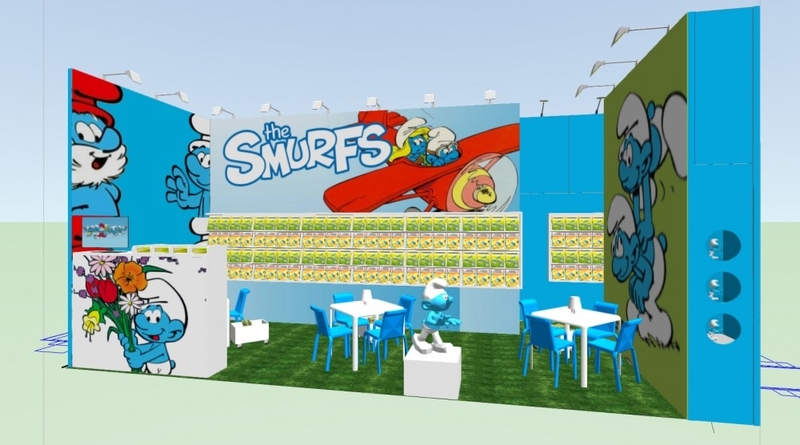 The main objectives were to improve the graphic communication, to promote the playful side of the brand throughout the stand and to create a concept that can be used in various exhibition spaces, fairs and for different target publics. IMPS had previously opted for a traditional construction and visuals printed on vinyl directly stuck to the structure. This solution did not provide a constant high quality graphic look (glue problem linked to temperature changes in the halls, among other things) or the possibility to reuse the materials. Our architects have opted for printing on large integrated printed canvases into a Be-matrix frames structure and the creation of custom and modular furniture. Although previously, the playful side was mainly reflected through visuals, our architects have emphasised it in the general atmosphere of the stand with many details (furniture and customised lamps, grass floor, etc.). IMPS has therefore invested in a Be-matrix structure and in usable furniture. 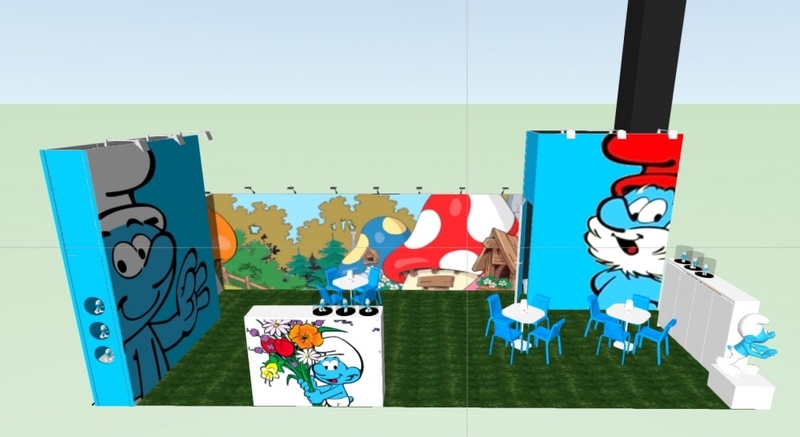 The canvases are printed according to the different conventions to fit the dimensions of the stand and the public. The canvases are of course stored for possible re-use. In short, an economic, ecological, and qualitative solution. The main challenge was to create a structure and furniture that can be used in variable exhibition spaces (different quantities of open sides, surface,..), that respect the regulations of each fair and the budget limits of the client and that adapt to the "subject" of the fair and therefore the products presented. 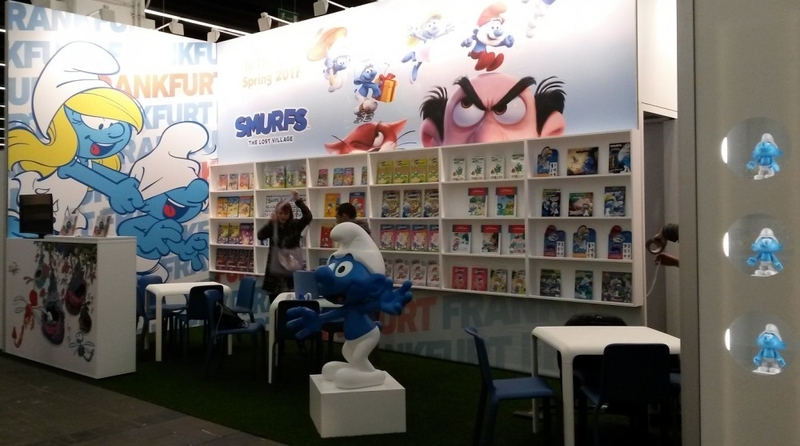 At fairs like Bologna Children Bookfair and Frankfurt Book Fair, the furniture should allow to present books and at Brand Licensing Europe in London to present figurines. We will carefully analyse your request with creativity, regardless of its size, so as to offer you a clever solution tailored to your needs.